This is a great example of a well-phased project. 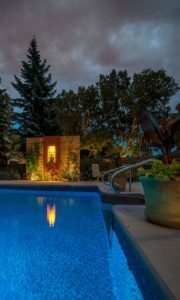 When we first started working with our clients, they had an existing pool, concrete pool deck, as well as a wooden deck off the back of the house. 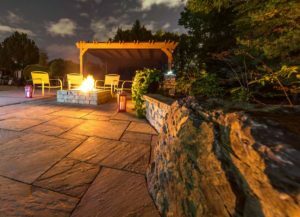 From this point, they knew that they wanted to develop a large patio area that could accommodate a fire pit as well as a gazebo. They love to entertain in the backyard, so a screened-in space was very important. And since they host often, a designated outdoor kitchen space was also on their wish list. After working through the design process, we were able to work out a phased construction plan that would accommodate their budgetary allowance and that would be completed over a couple of years. 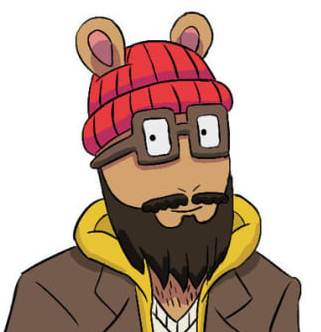 Each phase had to be functional. We wanted the yard to be usable and look finished after each season of construction. 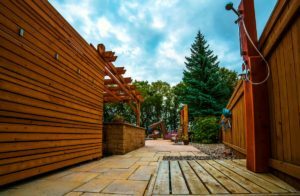 The first phase of the project involved installing the patio, retaining wall, cedar pergola, and a firepit, which gave the clients even more usable entertainment space. 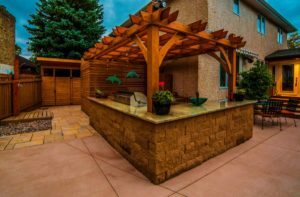 In order to save costs in the first year, we installed the 16’x16’ cedar pergola but held off on the retractable screens until the following season. Since we knew the screens would be going in eventually, we built the pergola on concrete piles to ensure that it was structurally stable and that shifting would not compromise the retraction mechanism. The retractable screens and roof cover were the first things to be added to the pergola at the beginning of the next season. The clients have mentioned that the screened-in gazebo is the most used part of their yard. 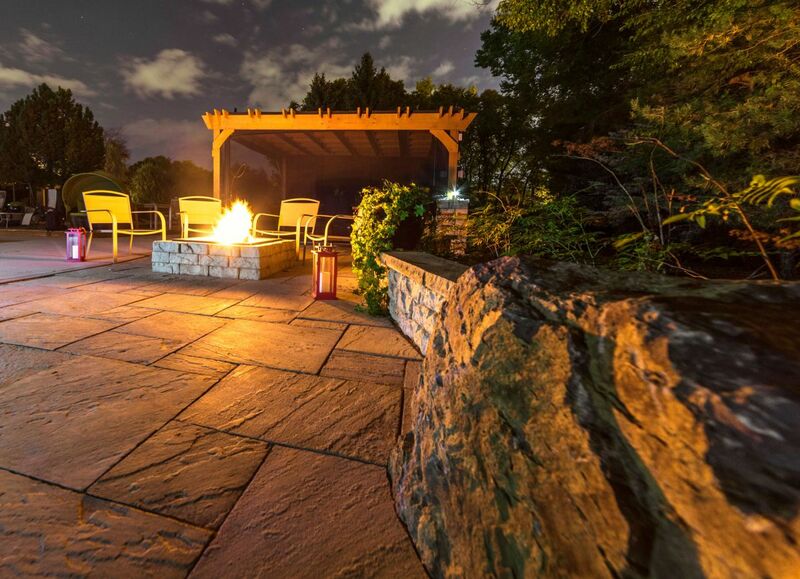 Being able to enjoy the outdoors at any time of the day or night without any bugs is amazing! During this season we also completed the majority of the softscaping and planting around the existing hardscape areas. An artificial putting green was installed near the new cedar gazebo. In the final year we focused on developing the custom kitchen area and changing rooms. We built a custom L-shaped kitchen near the pool with plenty of storage, a BBQ, and even a sink. In order to keep things as low-maintenance as possible, a beautiful Surf Green granite counter was installed. Granite is a great option for outdoor kitchens. We also built a cedar pergola above the kitchen area to add some shade to this space. 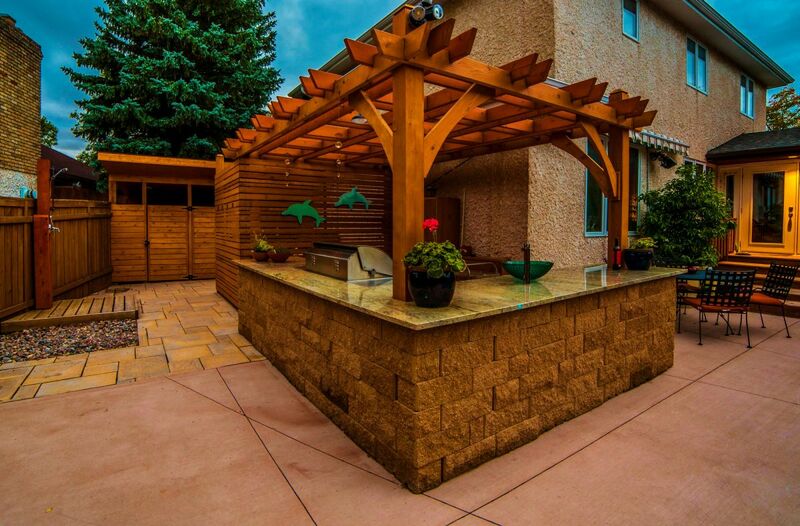 The kitchen pergola was made to match the style of the existing screened-in pergola. This design detail really tied the two areas together! 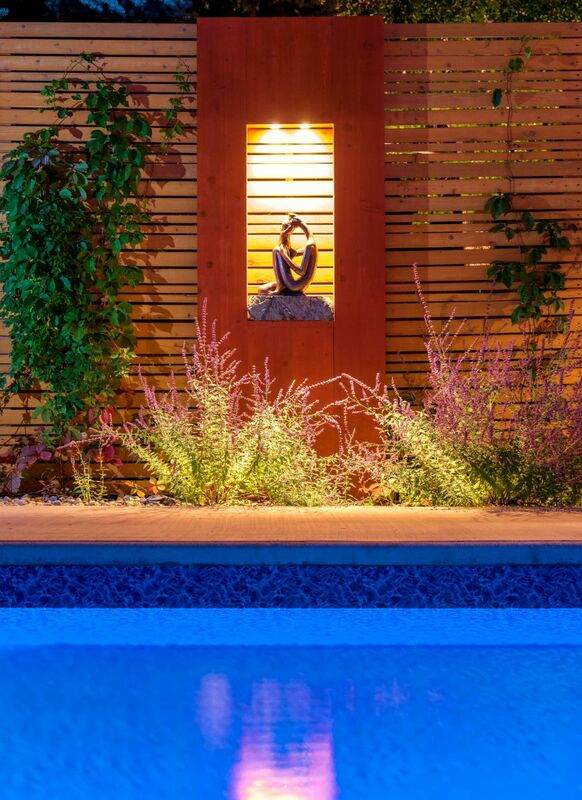 Beautiful, cedar privacy screens were added to hide the pool equipment and the two change huts were constructed along the back of the existing fence. An outdoor shower was the finishing touch for this exciting project.